As your Jacksonville landscaping, irrigation, and backyard renovation specialists, we want you to get the most out of your yard year-round. At C & L Landscape, we love providing beautiful spaces for people to spend time, play games, and enjoy life together. Even though Florida is known for sunshine and warm weather, those of us who live in northern Florida know that it can get pretty cold during the winter, especially at night when it often dips into the low 40s. While it can be tempting to keep the door to the backyard closed for a few months, cold weather doesn’t necessarily have to send you running inside. 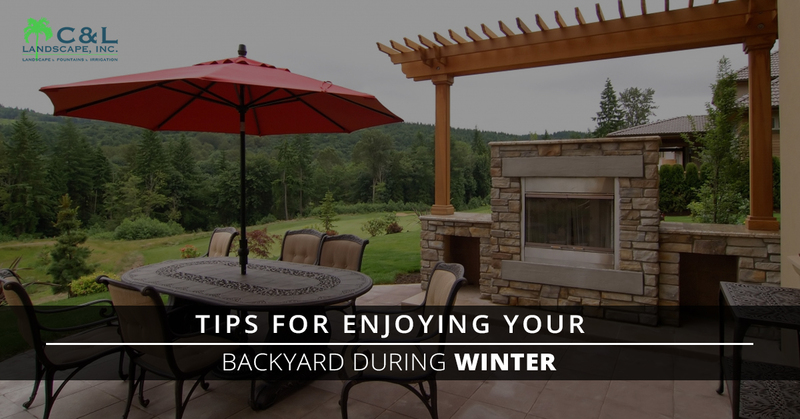 Here are five great ways to get the most out of your backyard – even during the winter. Let’s face it, you’re more likely to sit out on your patio if you actually have a patio. While some camping chairs in the grass might cut it for summer, you’re most likely not going to want to put your toes in cold, wet grass during the winter. This is the perfect time to install a patio with brick pavers, to enlarge your patio, or to make a repair to a cracked, old patio. Before you know it, summer will be here again and wouldn’t you love to have a fresh, new patio for backyard barbecues? Perhaps you’ve heard in the past few months about the Danish lifestyle concept of ‘hygge’. Roughly translated to ‘coziness,’ the concept of hygge means creating a warm, inviting, and cozy atmosphere, both inside and outside of the home. Start by investing in some durable but soft outdoor patio furniture to help bring the inside out. Add a firepit or install an outdoor fireplace to draw people to the patio. Nothing delights hearts more than making s’mores over a real fire. Grab the kids and head outside to roast marshmallows and share stories. For even more fun, make an entire meal on the fire! Warm up some hotdogs over the flames and spend the entire night eating outside. As much as we want you to enjoy your backyard during the winter, we know that this is actually a great time to schedule renovations. Whether you want to install a beautifully crafted pergola, swap the grill for an outdoor kitchen, install a swimming pool, or upgrade your sprinkler system, the next few months are the perfect time to get started. Sometimes the best way to enjoy your yard during the winter is to get it in the best shape ever for next summer! We are more than just a Jacksonville landscaping company. We also specialize in patios, outdoor kitchens, backyard screens, pools, and more. We want you to enjoy your backyard 12 months a year. Schedule a free consultation and estimate today and find out how we can help turn your backyard into a Florida winter wonderland!